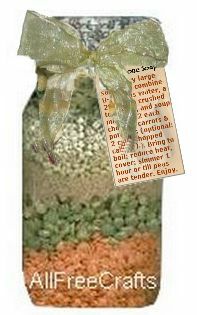 Homemade minestrone soup jar mix looks great layered in a mason jar for gift giving. 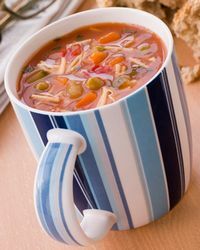 Easy recipe, easy assembly – and the finished soup is delish. We’ve created a free printable jar label for you as well! 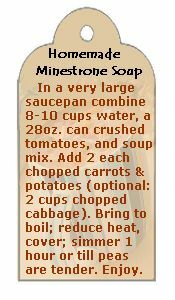 In a very large saucepan combine 8 to 10 cups of water, a 28 oz. can of crushed tomatoes, and soup mix. Add 2 chopped carrots, and 2 to 4 chopped potatoes (optional: 2 cups chopped cabbage). Bring to a boil, reduce heat, cover and simmer for one hour or until peas are tender. I totally loved the minestrone soup. I also did the chicken noodle soup. They are not only great as gifts but also for home when visitors drop by. You just put the jar ingredient in the pot with whatever else you want to add. Let it simmer and enjoy the visit of your guests while the soup cooks.